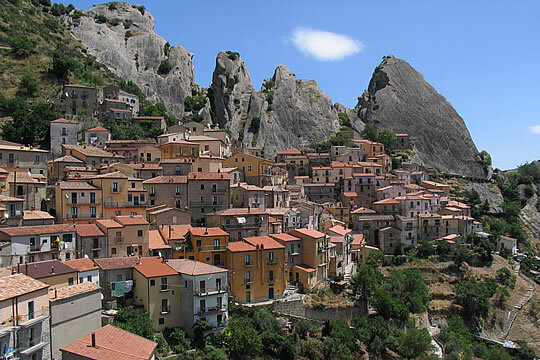 Castelmezzano is a small town in the province of Potenza, it’s among the finest treasures of Basilicata. The most attractive feature of Castelmezzano is offered by the backdrop of the Lucanian Dolomites. Over time the rain and wind have carved the sandstone shapes to which the popular tradition has given special names, in fact, under certain conditions of light and shadows they are particulary similar to the "beak of the owl," the "snapdragon" the "anvil" and "golden eagle". The arrival in the small village is quite unusual because it can be entered through a tunnel carved into the rock after crossing a spectacular gorge. Leaving the gallery Castelmezzano looks like a small crib defended and protected by the Lucanian Dolomites. The urban structure of Castelmezzano is typically medieval: a cluster of houses with roofs concentric sandstone slabs embedded in a rocky basin. Walking through the old town is particularly attractive due to the presence of buildings included in the rock, for the many steep stairs that open up between the lanes, inviting to climb to the heights above where you can enjoy the beautiful scenery of the Dolomites of Lucania. 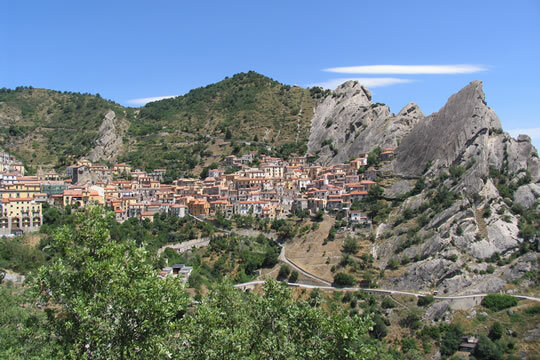 It’s this balanced relationship of the town and the natural heritage around, respecting the surrounding landscape, tha has allowed Castelmezzano city-nature to be defined and included in the club of the most beautiful villages in Italy. From Castelmezzano you can reach the opposite town of Pietrapertosa, and vice versa, making the Angel Flight.